With their looser fit, paperbag waist pants are known for their comfort. Because of the ruffled waistline and extra volume, they can often be tricky to style. Here are some steps to follow to make sure you look amazing. While extremely comfortable, they aren’t always the best option depending on what part of your body that you wish to emphasize or de-emphasize. You may want to avoid them if you carry most of your weight in your midsection, or lack a defined waist. If you are on the short side, paperbag waist pants can sometimes overwhelm your frame because of their extra volume. To ensure that they flatter your figure, choose a cropped pair that hits no further down than your ankle. Capri pants with a paperbag waist can be very flattering if you are petite. If you’re plus size, or worried about making your midsection appear larger, opt for a wide-legged pair of pants. The extra volume in the legs helps balance your frame so the added material at your waist doesn’t stand out. Choose a form-fitting top. 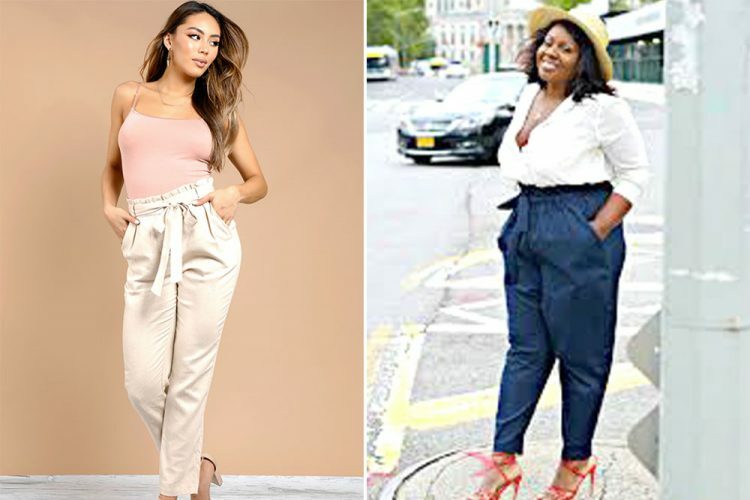 Because paperbag waist pants tend to be baggier and add more volume to your figure, it’s best to wear them with a fitted top, like a tank top. That will help balance the proportions in your outfit for the most flattering look. Tuck in your top. Even if your top is fitted, it can have an unflattering look if it sits over the waist of your pants. That’s why it’s best to tuck your top into the pants so the waist detail is highlighted and you don’t add any more bulk to your midsection. Pair the pants with a thin belt. You can add a belt to help give some definition to your waist. However, it’s best to use a thin style so the waist detail still stands out. Opt for shoes that add height. The extra volume that paperbag waist pants add to your figure can sometimes make you appear shorter. It’s best to wear the pants with shoes that have a heel, or add height to elongate the line of your legs. If you are tall, you can usually get away with pairing the pants with flats.